I woke up yesterday and took a look at look at a funny little post in Axios by Jonathan Swan, "Behind the scenes: Trump's power politics," about Señor Trumpanzee big-footing all over the GOP midterms. He always has to make them all about him-- even when that is a detriment. The first segment was about screwed up the OH-12 race. "Trump," wrote Swan, "thinks it's fun to have a stake in these elections, according to sources familiar with his thinking. And he sometimes seems awe-struck by the way his endorsements can move a stunning percentage of Republican voters." Last month Kobach and Colyer, the appointed incumbent governor, debated at Johnson County Community College. The atmosphere was pretty poisonous, which is pretty much what Trump has turned the GOP into. Needless to say, it was generally Kobach's fans who behaved like wild animals. “If this is what politics is, it makes me want to jump off the stage,” quipped Patrick Kucera, a Johnson County businessman and preacher mounting a long-shot campaign for the GOP nomination, in reference to arguments between the two leading candidates. Colyer jabbed Kobach for his performance in defending his office against a lawsuit in federal court. “Integrity is an issue for Republicans and there is only one candidate on this stage who has been fined by a federal judge for lying,” Colyer said as Kobach’s supporters booed. Kobach was fined $1,000 last year for misleading the court and faced additional sanctions from the court this year, including court-mandated classes on legal procedure, after a federal judge struck down the state’s proof of citizenship law, a policy crafted by Kobach. It was one of several instances where Kobach’s supporters attempted to shout down the governor as he attacked their candidate. Kobach had touted the law, which required voters to prove their citizenship before registering to vote, during his opening statement. He omitted the fact that a federal judge struck down the law as unconstitutional last month. During his closing statement, Kobach presented himself as the candidate that would be more than just “a steady hand on the tiller” in the face of battles over social values. “We’re going to have to fight for our values. We’re going to have to fight like a third monkey trying to get on Noah’s Ark. You understand me?” he said. Colyer returned to the attack about Kobach’s performance in court against the American Civil Liberties Union in his closing statement. Earlier in the debate, Colyer responded to a question about illegal immigration by pivoting to an unrelated attack against Kobach for seeking a pardon for Ryan Bader, a man who was convicted of aggravated robbery in 2009. Colyer denied the pardon last month and on the campaign trail he has repeatedly criticized Kobach’s advocacy for Bader, the vice president of a company that donated to Kobach’s campaign. “Yeah, I took his case. Because this man wanted his gun rights back,” Kobach said. Most polling shows Kobach ahead. Aside from Trumpanzee, he's been endorsed by the whole American neo-Nazi infrastructure-- Trumpanzee, Jr., Hannity, Ann Coulter, Ted Nugent... Although there are 5 Democrats running, the top 2 contenders today are state Senator Laura Kelly and Carl Brewer, a former Wichita mayor. Greg Orman, a businessman who ran for Senate in 2014, is in this race as an independent. Orman has been endorsed by one of Nancy Jacobson's No Labels SuperPACs, Unite America, a right of center outfit that is funded by conservative billionaires. The most recent general election poll shows that Colyer would beat Kelly but that Kelly leads Kobach. Democrats see an opportunity to pick up the governorship if Lobach wins the primary, counting on Kansans deciding they are sick of extremists. 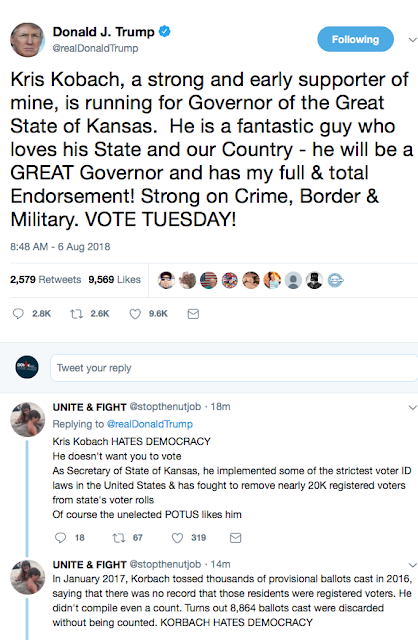 I really hope Kobach ends up in prison one day for all the votes he took away from the American people over the last decade with his interstate crosscheck program. I can't believe anyone would actually vote for him. He's literally against democracy and voting. All a democrat should need to tell Kansas voters about Kobach is how much money he cost the state over his legal issues. They are still trying to recover from all the crap Gov. Brownshirt put them through! What other state ground pavement to gravel rather than fix the potholes "to save money"?
" Gentlemen, gentlemen! I won't take any more credit for this victory than necessary. Lord Kitschener did not - nay, will not - die in vain, grid willing. [Applause] Gentlemen, gentlemen - I, as leader, will use power like a drum, and leadership like a violin. Take out any idea. Compare ideas, with the one idea left we are left you have no doubt and without a doubt we have enthusiasm! Gentlemen, gentlemen, please, gentlemen - to make life whole, it's as easy as a bridge! Now, now, gentle- gentlemen, now that we have obtained control we must pull together as one - like a twin! Keeping the prophecy of power as enthusiasm! All for one! - and all for one! Let me hear it for me! KS, where voters vote regularly for their own slow deaths. America in microcosm. Everyone who voted for $hillbillary; everyone who votes for any Nazi; everyone who voted for brownback and kobach; everyone who supports trump; every white racist fucktard; everyone who does as DWT admonishes -- hold your nose and vote 'D'... you all deserve what you get. True since 1981. This is America. The next Nazi reich experiment to spectacularly fail. And nobody will ever figure out why.